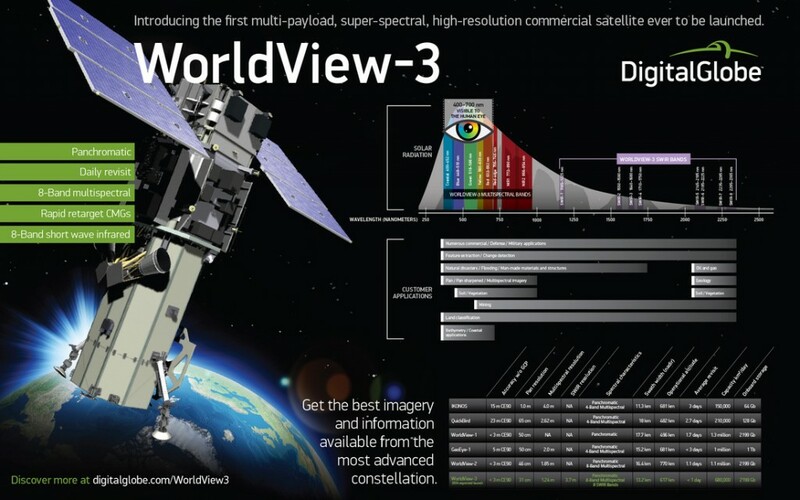 WorldView-3 is a commercial Earth Observation Satellite operated by DigitalGlobe, a U.S. company offering high-resolution satellite imagery on the commercial market. The satellite is the most powerful commercial Earth Observation spacecraft ever launched to join DigitalGlobe’s existing fleet of EO satellites. DigitalGlobe was founded in 1992 as WorldView Imaging when the Land Remote Sensing Policy Act was introduced, permitting private companies to acquire and sell satellite imagery in the United States. The firm obtained its first high-resolution commercial remote sensing license in 1993. Financial backing was provided by private funders from around the world. The company was re-named EarthWatch Incorporated after merging with the commercial remote sensing branch of Ball Aerospace & Technology Corp. Early Bird-1 was the first satellite built and launched by the company. It launched from Russia atop a Start-1 rocket in 1997 to deliver imagery at a ground resolution of 3 meters, but the craft suffered an electrical failure four days after launch and could no longer be operated. In 2001, EarthWatch was re-named DigitalGlobe and launched the QuickBird-2 satellite after the QuickBird-1 satellite was lost the year before due to a launch vehicle failure. The QuickBird-2 satellite was capable of delivering images at a panchromatic resolution of 0.61 meters. The first WorldView satellite was launched atop a Delta II in September 2007. Built by Ball Aerospace, the satellite is capable of collecting images with a ground resolution of 50 centimeters in the panchromatic band. WorldView-2 launched in 2009 carrying a panchromatic sensor to acquire images at a resolution of 46 centimeters and a multispectral payload that achieves a resolution of 184 centimeters. Satellite images collected by DigitalGlobe are being sold to commercial customers for a variety of purposes such as land management and monitoring, urban planning, scientific studies and other applications. The majority of high resolution images of Google Earth and Google Maps are provided by DigitalGlobe. U.S. federal agencies such as NASA and the National Geospatial-Intelligence Agency also purchase imagery from DigitalGlobe. Last year, DigitalGlobe purchased GeoEye, its prime competitor on the American market. With that, DigitalGlobe acquired GeoEye’s active satellites, namely IKONOS with a 82cm panchromatic resolution launched in 1999, and GeoEye-1 launched in 2008, capable of collecting panchromatic images at a resolution of 41 centimeters and multispectral imagery at a resolution of 1.65 meters. 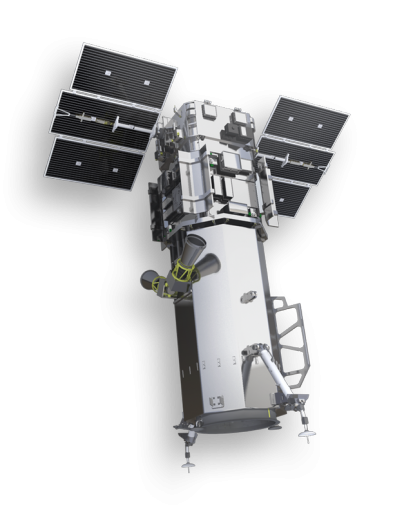 GeoEye-2, currently in the late stages of assembly, will be re-named WorldView-4 to be launched by DigitalGlobe in 2016 to satisfy the increasing demand for high-resolution Earth imagery. The satellite, built by Lockheed Martin, will have a ground sample distance of 34 centimeters, its optical payload being developed by ITT Corporation. In 2014, DigitalGlobe announced that it had received notice from the U.S. Department of Commerce that the company would be allowed to sell its highest-quality commercial satellite imagery. Effective immediately, DigitalGlobe is now permitted to sell their customers imagery at the highest-resolution as acquired by the current satellite constellation. The updated approvals will also permit the company to sell imagery with up to 0.25-meter Ground Sample Distance in panchromatic bands and 1.0-meter GSD in multispectral bands to all customers six months after the launch of WorldView-3. In August 2010, DigitalGlobe was awarded a Service Level Agreement within the Enhanced View program of the National Geospatial-Intelligence Agency that includes a cost share for the development and launch of the WorldView-3 satellite. 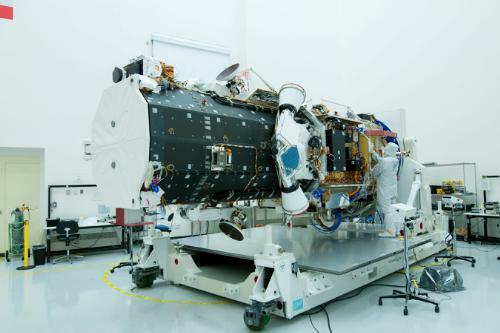 DigitalGlobe awarded a contract to Ball Aerospace to build the WV-3 satellite platform while ITT Industries received the contract for the optical imaging payload for the spacecraft. 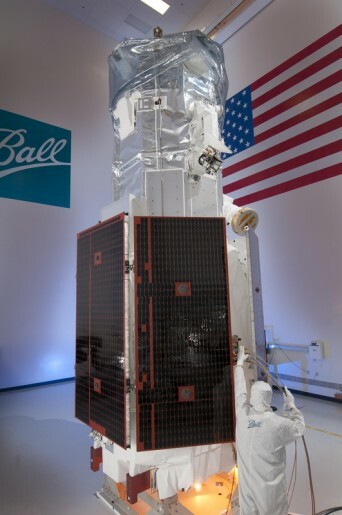 Like the previous two WorldView satellites, WorldView-3 uses Ball’s BCP-5000 satellite platform, a high-performance satellite platform capable of hosting optical and radar payloads providing increased power, precise pointing, high agility and increased data storage and downlink capability. Overall, the satellite is 5.7 meters tall and 2.5 meters wide in its stowed configuration while having a span of 7.1 meters with its two power-generating solar arrays deployed in orbit. WorldView-3 has a mass of around 2,800 Kilograms. The satellite consists of several components starting in the aft section with the Control Moment Gyro Module followed by the Propulsion Module, the Spacecraft Bus Section and the Telescope Payload. The Payload itself features a an aperture cover, sun shade, the telescope optics and the Focal Plane Unit. Electrical power is provided by two three-segment solar arrays that are installed on a rotary joint to allow the arrays to track the sun for increased power generation. The arrays deliver 3,100 Watts of electrical power that is distributed via a Power Conditioning and Distribution Unit that routes power to and from a 100 Amp-hour battery that supplies power to the various satellite systems as part of a redundant power system architecture. WorldView-3 is equipped with a range of navigation sensors including star trackers, sun sensors, a precision Inertial Reference Unit and a GPS receiver. Attitude control is accomplished using Ball’s Advanced Control Moment Gyroscopes that provide a high-precision while also delivering high torques to achieve rapid re-orientation maneuvers. Using these CMGs, WorldView-3 is capable of performing slew maneuvers from one imaging target to the next within five seconds as opposed to 30 to 45 seconds that are required for conventional reaction wheel systems. A slew of 200 Kilometers on the ground takes 12 seconds using the advanced CMGs. The Attitude Control System provides excellent targeting of ground locations with and accuracy of 500 meters. A geolocation accuracy of up to 3.5 meters can be reached with WV-3. WorldView-3 is equipped with a Propulsion System to be used for precise orbit maintenance. Imagery acquired by the telescope is stored in a 2.199 Tbit solid state recorder with error detection and correction. Downlink of data is accomplished using an X-Band communication system that operates at data rates of 800 and 1,200 Mbit/s. Housekeeping data can be downlinked via X-Band in real time at rates of 4, 16, 32 or 64 kbit/s while stored telemetry data is downlinked at 524 kbit/s. Command uplink is done via S-Band at data rates of 2 or 64 kbit/s. 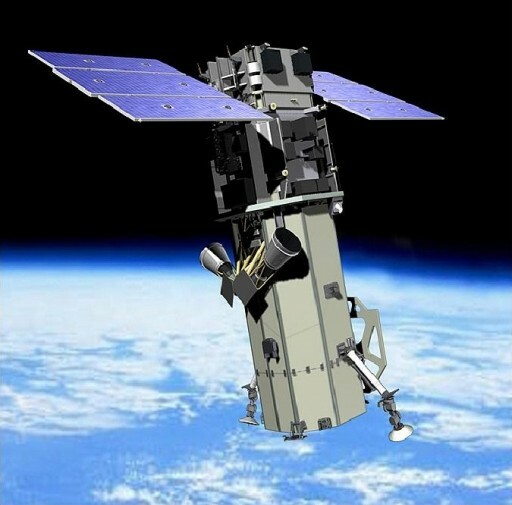 The payload of WorldView-3 is known as a superspectral-imager consisting of a high-performance telescope, an imaging sensor and a Shortwave Infrared System. Additionally, WV-3 is equipped with the CAVIS payload built by Ball Aerospace (Clouds, Aerosols, Vapors, Ice, and Snow). The telescope aperture measures 1.1 meter in diameter. In total, the satellite covers 29 spectral bands including a panchromatic band, eight multispectral bands, 8 shortwave infrared bands and 12 CAVIS bands. 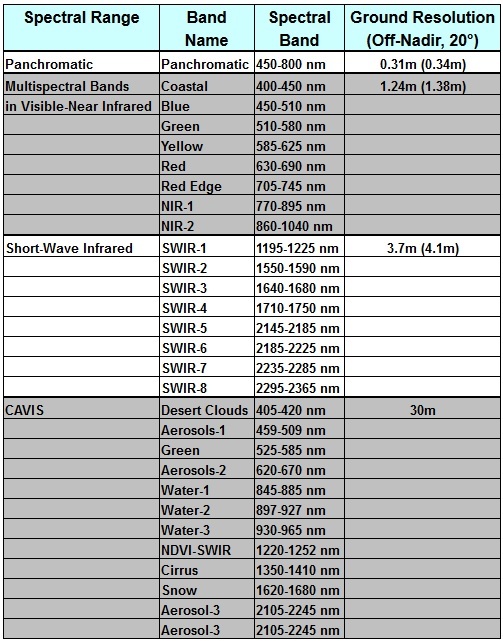 The imaging payload achieves a ground resolution of 31 centimeters in the panchromatic band at nadir, 1.24m in the multispectral bands, 3.7m in the shortwave infrared range and 30 meters for CAVIS. Off-nadir resolutions (20°) are 0.34m for PAN, 1.38m for MS and 4.1m for SWIR. WorldView-3 covers a ground swath of 13.1 Kilometers supporting multiple swath imaging for mosaic image creation and stereo imaging. The satellite can acquire five strips to create an image of an area of 66.5 by 112 Kilometers in a single pass. For stereo imaging, two pairs of images measuring 26.6 by 112 Kilometers can be acquired in one pass. With its high agility, WorldView-3 delivers a revisit time of under one day for any given location on Earth with a one-meter ground resolution or better. Revisit times for an off-nadir angle of 20 degrees or less is on the order of 4.5 days. 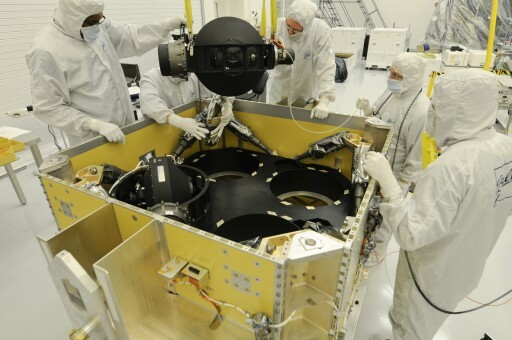 The CAVIS imager is used to provide data for atmospheric monitoring and to deliver data for the correction of high-resolution imagery collected by the imaging payload when taken through haze, dust and other atmospheric obscurants. In total, WorldView-3 will be able to provide imagery of a ground area 680,000 square Kilometers per day to be used by the U.S. government, oil and gas industries, scientists and land/urban developers. 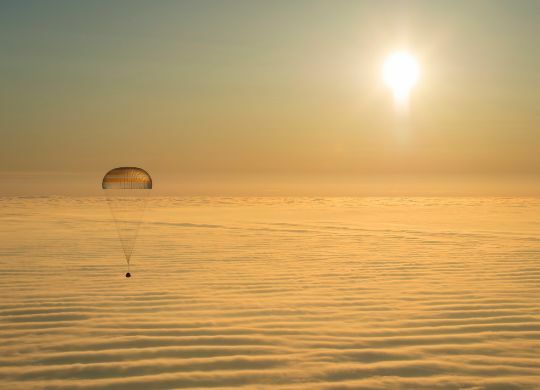 WorldView-3 will operate from a circular Sun-Synchronous Orbit at an altitude of 617 Kilometers at an inclination of 98° with a local time of descending node of 13:30.